North London Colonic Irrigation | Why Come To Me? Specialist in colonic irrigation & digestive health disorders. I was once very unwell and used colonic irrigation as part of my own healing process. This means that the very treatment I use for you, I've successfully used myself, and achieved positive results. I'm in a unique position to help you. Since childhood, I used to suffer from chronic constipation; if I managed to pass a bowel motion once a week, I was pleased. In my early 20's I developed Grand Mal epilepsy (which affects the entire brain), hormonal imbalance and leaky gut syndrome. At that time I didn't see how any of these conditions were related. I was seeing all the best doctors, specialists in each area, and I honestly believed I was getting the best that money could buy. I didn't question anything, even though deep down I intuitively knew that pharmaceutical medicines weren't going to help me long term. This all culminated at the age of 28, when I was diagnosed with ovarian failure. I was told that that I would never be able to conceive naturally and would need to have my one working ovary removed—it had a huge cyst growing on it. My other ovary had atrophied and appeared not to be functioning at all. I couldn't keep going on like this. Surely I was too young to be having all these health problems? Removing my last working ovary seemed too drastic, too final. Surely there must be another way? Around that time I began looking into Natural Medicine. It had always fascinated me, but since there was so much negative publicity, dismissive doctors and not enough time, I had dismissed it myself as quackery. Naturopathy is a system of healthcare which encourages and promotes the body's natural self-healing mechanisms using: nutrition, herbs, hydrotherapy, detoxification, homeopathy, bodywork and exercise. 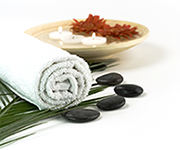 Naturopathy works with the body rather than against its natural healing capability. By giving the body what it needs to heal itself, it will naturally fall back into balance, eradicating symptoms and conditions of ill health. When the body heals, it doesn't selectively heal itself of one disease, it heals the whole body by bringing itself back to perfect balance. Conventional medicines are made synthetically; the body is unable to process them properly, so you get side effects. These side effects, or symptoms, are the body's way of telling us that something is not right. Pain, symptoms, disease are ways the body uses to communicate with us that we are doing something wrong. This is when we need to intuitively listen to what is happening and take action to remedy the situation before it becomes chronic and potentially lethal. I'm sure you've been told many times that "prevention is better than cure." I was determined to try another way, a natural way. So I made a commitment to myself to change my life. I completed a personal training and pilates course; incorporated several different methods of natural healing into my life such as: nutrition, herbal medicine, colonic hydrotherapy and meditation. My body began to heal itself naturally. I came off my anti-epileptic medication and I fell pregnant—something my gynaecologist said would never happen! But best of all I felt well again, and amazingly: my eyesight improved and I reduced my prescription; my PMS was occasional and mild; and my outlook on life was much brighter and more positive. I was excited by the positive results! I wanted to empower fellow sufferers, so I studied for four years and attained qualifications in Live Blood Microscopy, Iridology and a Diploma in Colonic Hydrotherapy. I took charge of my own health and now my life couldn't be better! Now I can help you take charge of yours.